The Natural Health Place, LLC. (Lighthouse Chiropractic) (Kelley Chiropractic Center, LLC) is located at 5220 NE Shell World Place, Suite B, in Newport, Oregon. Click the links below for directions. If you have questions, click here for contact information. You will be on highway 101 (N. Coast Hwy). At the traffic light for the lighthouse at the north end of Newport, you will turn left. This is the first light north of Newport. We are located in the northwest corner of the first building on your left. The entrance to the parking lot is just around the left turn at the north end of this building. After crossing the bridge into Newport continue to the intersection of Hwy 101 and Hwy 20. 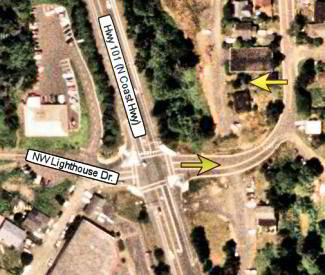 Continue north on Hwy 101 until you reach the fifth traffic light at the lighthouse north of Newport. Turn right at this fifth traffic light north of Hwy 20. You will be on highway 20. Continue into Newport until you reach the Hwy 101 (N. Coast Hwy) intersection. Continue north on Hwy 101 until you reach the fifth stoplight at the lighthouse north of Newport. Turn right at the fifth traffic light north of Hwy 20.